New York's Melancholy Rockers Interpol Hear Interpol perform at Washington, D.C.'s 9:30 Club. The full concert includes an opening performance by Blonde Redhead and an interview with Interpol guitarist Daniel Kessler and drummer Sam Fogarino. This concert at Washington, DC's 9:30 Club originally streamed live from NPR.org on Saturday, March 26. 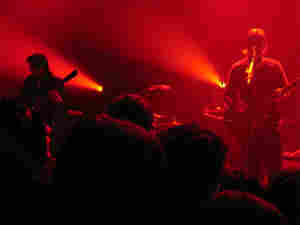 Interpol is currently one of New York's most popular bands. Their most recent CD is called Antics. Blonde Redhead's latest CD is Misery is a Butterfly.